So the massive news for the 2012 Predator release, is that they will no longer be called the D5. 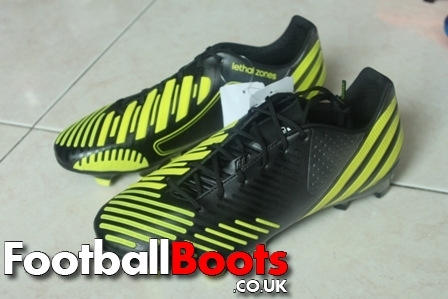 adidas have decided to call them the Predator LZ; the name coming from the lethal zones on the boot, you can see from the images we have of the boots that Lethal Zones will now be embroidered on the upper. 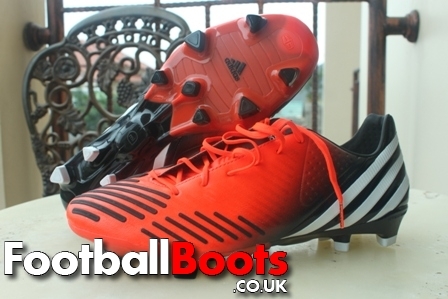 We aren’t sure why adidas have ditched the D5 name, but the 2012 Predator will be the LZ. 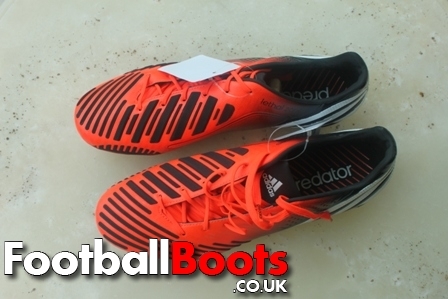 We have lots of great first look images of the traditionally favoured colour-way for Predators and we think it looks amazing! What are your thoughts? These Predator’s have a synthetic leather upper and the five zones on them (hence the previous D5 name) using various pods and stripes that should enhance ball control and passing accuracy. 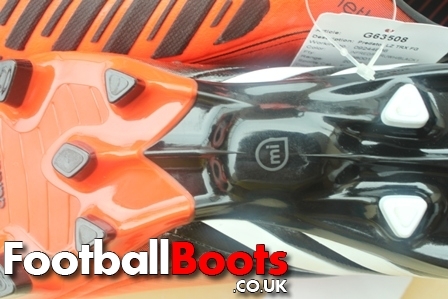 They will also be the first Predators with miCoach, you can see the sole of the boot with the miCoach area in the image below. As well as the traditional red/black white Preds there are also a couple of images of other colourways, the Bright Blue/Infared/Collegiate Navy/White and Black/Green/Infared. 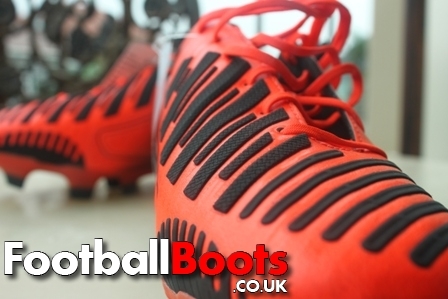 If you think these boots look as great as we do please like this post and tweet about it! when will the lime/black colorway be released? These Shoes are going In My List Forsure! So what about the white color way with the orange strips? I would love to get these in the original white color way. These boots look like adipure and f50 mixed together but with fake synthetic leather, all I can say they should of just kept making them out of real calfskin or real kangaroo leather..
ni boot bru ke..aq xpna tngok pon sblm nie. 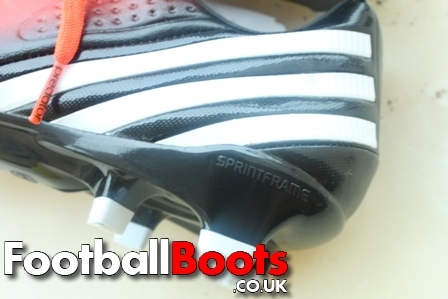 cant understand why adidas have gone with a synthetic upper instead of a calf skin leather like they usually do. 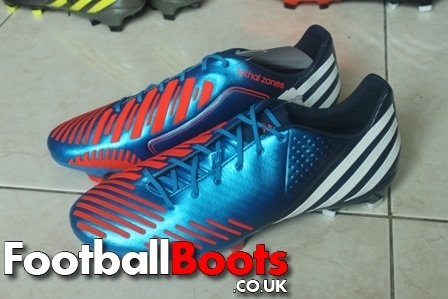 adidas are to focussed on making a light wieght boot rather a good boot now days. and this boot in know way will improve your touch of pass ability :L.
Some one needs to knock some sense on the designers on the predator adidas department , these boots are fine for the f50 roster not for the predators, why ruin a perfect boot of the year for 2011 into this light weight crap. Not every player is interested on lightweight technology especially middlefilders. Release these as f50 & keep the current predz or lose your faithful predator fans to nike I’m sure they would find the ctr 360 more better suiting their style of play than these ugly looking f50’ish fake predz. Do you make deliveries to Bolivia? Finally a rival for the Nike CTR360 Maestri. I always thought that the adipower was soon goner turn into a mi coach compatible boot and I thought the adipower was great but adidas ruined the look , the weight and the power, it simply turned into an ultra light , not good looking , crap boot . In my point of view I think this boot is not a predator but simply a f50 adizero. the current preds are just great but still adidas must add the micoach tech so it could be better. these are crap these are nothing like how predators should be, look at the originals in comparison to these, predators should be proper kangaroo leather not synthetic plastic like F50s. Adidas needs to stop changing things up. They better keep making adiPowers. Predators aren’t supposed to be ridiculously light. Not a fan. The current Preds are fantastic, why release a new design so quickly?